The new Alfa Romeo 4C is one of the Best car to buy in 2015. But currently, the auto manufacturer has presented the 4C Spider at the annual auto show in Detroit. 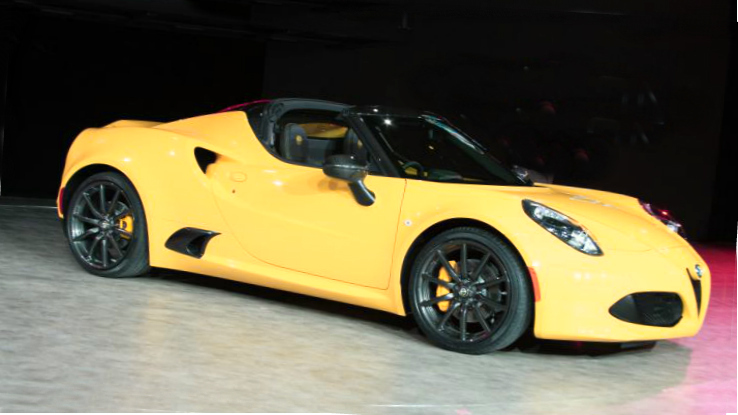 The 4C Spider has come as the car of 2015 model year. It is the first convertible model of Alfa Romeo since the time of the 8C Spider, which was sold in 2009. The novelty has not lost the performance in spite of it has become heavier by 22 lbs than the 4C coupe, its weight is about 2,487 pounds. The new Alfa Romeo’s model is equipped with the 1.75-liter four-cylinder engine, which is able to produce the output of 237 horsepower and the torque of 258 lb-ft. The powertrain is updated with the aluminum block and the special intakes to increase sporty notes in the car. The 4C Spider's powertrain that is mounted in the middle works with the six-speed dual-clutch gearbox. The wheels are 18-inch with 235/35Z tires. However, the novelty is available with smaller wheels -17 inch with 205/40 tires. The standard equipment includes vented steel discs and Brembo calipers in the braking system. The car is able to get acceleration from 0 mph to 60 mph in 4.1 seconds; the maximum speed is 160 mph. The auto manufacturer will produce the novelty at the Modena plant, where there is the Maserati production. The pricing is expected to be about 55k dollars. However, the carmaker has not announced that information yet. Meanwhile, the automaker is ready to present an optional pack for its novelty. It is the Track pack. The peck includes new high-performance shock absorbers with big front and back sway bars and the 18-inch and 19-inch aluminum wheels with the Pirelli P-Zero AR racing tires.